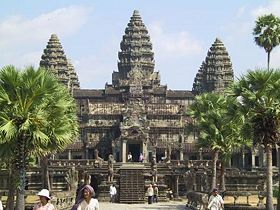 Angkor Wat (meaning: "Capital Temple") is an ancient temple complex (originally Hindu but later becomming Buddhist) dating from the twelfth century C.E.. It is located at Angkor, Cambodia. The title "Angkor Wat" is the modern name of the temple; its original name is unknown. Built for king Suryavarman II in the early twelfth century as his state temple and capital city, Angkor Wat was the epitome of the high classical style of Khmer architecture. The temple was designed to represent Mount Meru, home of the gods in Hindu mythology. It combines two basic plans of Khmer temple architecture: the temple mountain and the later galleried temples. It is surrounded by a moat and an outer wall 3.6 km (2.2 miles) long with three rectangular galleries, each raised above the next. At the center of the temple stands a quincunx of towers. Unlike most Angkorian temples, Angkor Wat is oriented to the west; scholars are divided as to the significance of this. Originally constructed as a temple dedicated to the Hindu god Vishnu, it switched hands to Theravada Buddhism in the fourteenth or fifteenth century. Angkor Wat has become a symbol of Cambodia, appearing on its national flag. It is the country's prime attraction for visitors. The site remains a significant Buddhist religious center in Cambodia today. The temple is admired for its extensive bas-reliefs and the numerous devatas adorning its walls, as well as for its grandeur and harmony of architecture. Angkor Wat is the southernmost temple of Angkor's main group of sites. The initial design and construction of the temple took place in the first half of the twelfth century, during the reign of Suryavarman II (ruled 1113 – c. 1150). Dedicated to Vishnu, it was built as the king's state temple and capital city. As neither the foundation stela nor any contemporary inscriptions referring to the temple have been found, its original name is unknown. It is located 5.5 km north of the modern town of Siem Reap, and a short distance south and slightly east of the previous capital, which was centered on the Baphuon temple. Work seems to have come to an end on the king's death, with some of the bas-reliefs unfinished. 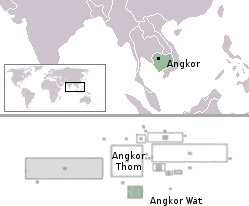 In 1177 Angkor was sacked by the Chams, the traditional enemies of the Khmer. Thereafter the empire was restored by a new king, Jayavarman VII, who established a new capital and state temple (Angkor Thom and the Bayon respectively) which lie a few kilometers to the north. Angkor Wat is unusual among the Angkor temples because it was never completely abandoned. Its moat also provided some protection from encroachment by the jungle. 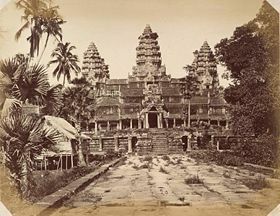 An 1866 photograph of Angkor Wat by Emile Gsell. In the fourteenth or fifteenth century the temple was converted to Theravada Buddhist use, which continues to the present day. One of these temples—a rival to that of Solomon, and erected by some ancient Michelangelo—might take an honourable place beside our most beautiful buildings. It is grander than anything left to us by Greece or Rome, and presents a sad contrast to the state of barbarism in which the nation is now plunged. Mouhot, like other early Western visitors, was unable to believe that the Khmers could have built the temple, and mistakenly dated it to around the same era as Rome. In the twentieth century, Angkor Wat underwent considerable restoration work including the removal of accumulated earth and vegetation. Work was interrupted by the civil war and Khmer Rouge control of the country during the 1970s and 1980s, but relatively little damage was done during this period other than the theft and destruction of mostly post-Angkorian statues. A model of Angkor Wat prior to its decline shows the half-galleries of the lower level and intact towers at the corners of the second-level galleries. Angkor Wat is the prime example of the classical style of Khmer architecture—the Angkor Wat style—to which it has given its name. By the twelfth century Khmer architects had become more skilled and confident than before in the use of sandstone (rather than brick or laterite) as their main building material. The Angkor Wat style was followed by that of the Bayon period, in which quality was often sacrificed to quantity. Architecturally, the elements characteristic of the style include: the ogival, redented towers shaped like lotus buds; half-galleries to broaden passageways; axial galleries connecting enclosures; and the cruciform terraces which appear along the main axis of the temple. Most of the visible areas are of sandstone blocks, while laterite was used for the outer wall and for hidden structural parts. The binding agent used to join the blocks is yet to be identified, although natural resins or slaked lime have been suggested. Other elements of the design have been destroyed by looting and the passage of time, including gilded stucco on the towers, gilding on some figures on the bas-reliefs, and wooden ceiling panels and doors. Typical decorative elements are devatas (or apsaras), bas-reliefs, and on pediments extensive garlands and narrative scenes. Statuary is conservative, being more static and less graceful than earlier work. Angkor Wat temple is a representation of Mount Meru, the home of the gods in Hinduism: the central quincunx of towers symbolises the five peaks of the mountain, and the walls and moat the surrounding mountain ranges and ocean. Access to the upper areas of the temple was progressively more exclusive, with the laity being admitted only to the lowest level. A further interpretation of Angkor Wat has been proposed by Eleanor Mannikka. Drawing on the temple's alignment and dimensions, and on the content and arrangement of the bas-reliefs, she argues that these indicate a claimed new era of peace under king Suryavarman II: "as the measurements of solar and lunar time cycles were built into the sacred space of Angkor Wat, this divine mandate to rule was anchored to consecrated chambers and corridors meant to perpetuate the king's power and to honor and placate the deities manifest in the heavens above." Mannikka's suggestions have been received with a mixture of interest and scepticism in academic circles. She distances herself from the speculations of others, such as Graham Hancock, that Angkor Wat is part of a representation of the constellation Draco. The outer wall, 1025 by 802 meters and 4.5 meters high, is surrounded by a 30-meter apron of open ground and a moat 190 meters wide. 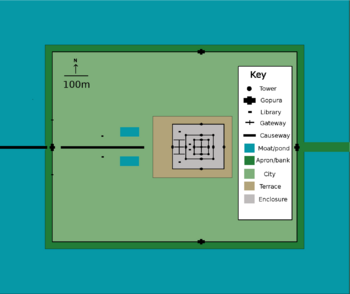 Access to the temple is by an earth bank to the east and a sandstone causeway to the west; the latter, the main entrance, is a later addition, possibly replacing a wooden bridge. There are gopuras at each of the cardinal points; the western is the largest and has three ruined towers. Glaize notes that this gopura both hides and echoes the form of the temple proper. Under the southern tower is a statue of Vishnu, known as Ta Reach, which may originally have occupied the temple's central shrine. Galleries run between the towers and as far as two further entrances on either side of the gopura often referred to as "elephant gates," as they are large enough to admit those animals. These galleries have square pillars on the outer (west) side and a closed wall on the inner (east) side. The ceiling between the pillars is decorated with lotus rosettes; the west face of the wall with dancing figures; and the east face of the wall with balustered windows, dancing male figures on prancing animals, and devatas, including (south of the entrance) the only one in the temple to be showing her teeth. Devatas are characteristic of the Angkor Wat style. The outer wall encloses a space of 820,000 square meters (203 acres), which besides the temple proper was originally occupied by the city and, to the north of the temple, the royal palace. Like all secular buildings of Angkor, these were built of perishable materials rather than of stone, so nothing remains of them except the outlines of some of the streets. Most of the area is now covered by forest. A 350 m causeway connects the western gopura to the temple proper, with naga balustrades and six sets of steps leading down to the city on either side. Each side also features a library with entrances at each cardinal point, in front of the third set of stairs from the entrance, and a pond between the library and the temple itself. The ponds are later additions to the design, as is the cruciform terrace guarded by lions connecting the causeway to the central structure. A view along the main axis of a model of Angkor Wat: in the foreground is the cruciform terrace which lies in front of the central structure. The temple proper stands on a terrace raised above the level of the city. It consists essentially of three rectangular galleries rising to a central tower; with each level higher than the last. Mannikka interprets these galleries as being dedicated to the king, Brahma and the moon, and Vishnu, respectively. Each gallery has a gopura at each of the cardinal points, and the two inner galleries each have towers at their corners, forming a quincunx with the central tower. Because of the temple's westward orientation, the features are all set back towards the east, leaving more space to be filled in each enclosure and gallery on the west side; for the same reason the west-facing steps are shallower than those on the other sides. The bas-relief of the Churning of the Sea of Milk shows Vishnu in the centre, his turtle avatar Kurma below, asuras and devas to left and right, and apsaras and Indra above. those unfortunate souls who are to be thrown down to hell to suffer a refined cruelty which, at times, seems to be a little disproportionate to the severity of the crimes committed. So it is that people who have damaged others' property have their bones broken, that the glutton is cleaved in two, that rice thieves are afflicted with enormous bellies of hot iron, that those who picked the flowers in the garden of Shiva have their heads pierced with nails, and thieves are exposed to cold discomfort. On the eastern gallery is one of the most celebrated scenes, the Churning of the Sea of Milk, showing 92 asuras and 88 devas using the serpent Vasuki to churn the sea under Vishnu's direction (Mannikka counts only 91 asuras, and explains the asymmetrical numbers as representing the number of days from the winter solstice to the spring equinox, and from the equinox to the summer solstice). It is followed by Vishnu defeating asuras (a 16th-century addition). The northern gallery shows Krishna's victory over Bana (where according to Glaize, "The workmanship is at its worst") and a battle between the Hindu gods and asuras. The north-west and south-west corner pavilions both feature much smaller-scale scenes, some unidentified but most from the Ramayana or the life of Krishna. Connecting the outer gallery to the second enclosure on the west side is a cruciform cloister, known by the modern name of Preah Poan (the "Hall of a Thousand Buddhas"). Buddha images were left in the cloister by pilgrims over the centuries, although most have now been removed. This area has many inscriptions relating the good deeds of pilgrims, most written in Khmer but others in Burmese and Japanese. The four small courtyards marked out by the cloister may originally have been filled with water. North and south of the cloister are libraries. Beyond, the second and inner galleries are connected to each other and to two flanking libraries by another cruciform terrace, again a later addition. From the second level upwards, devatas abound on the walls. The second-level enclosure is 100 by 115 m, and may originally have been flooded to represent the ocean around Mount Meru. Three sets of steps on each side lead up to the corner towers and gopuras of the inner gallery. The very steep stairways represent the difficulty of ascending to the kingdom of the gods. This inner gallery, called the Bakan, is a 60 meter square with axial galleries connecting each gopura with the central shrine, and subsidiary shrines located below the corner towers. The roofings of the galleries are decorated with the motif of the body of a snake ending in the heads of lions or garudas. Carved lintels and pediments decorate the entrances to the galleries and to the shrines. The tower above the central shrine rises 43 m to a height of 65 m above the ground; unlike those of previous temple mountains, the central tower is raised above the surrounding four. The shrine itself, originally occupied by a statue of Vishnu and open on each side, was walled in when the temple was converted to Theravada Buddhism, the new walls featuring standing Buddhas. In 1934 the conservator George Trouvé excavated the pit beneath the central shrine: filled with sand and water it had already been robbed of its treasure, but he did find a sacred foundation deposit of gold leaf two metres above ground level. Since the 1990s Angkor Wat has seen a resumption of conservation efforts and a massive increase in tourism. The temple is part of a World Heritage Site, established in 1992, which has provided some funding and has encouraged the Cambodian government to protect the site. The German Apsara Conservation Project (GACP) is working to protect the devatas and other bas-reliefs which decorate the temple from damage. 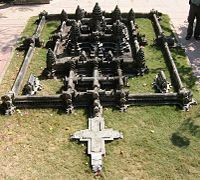 The organization's survey found that around 20 percent of the devatas were in very poor condition, mainly because of natural erosion and deterioration of the stone but also in part also due to earlier restoration efforts. Other work involves the repair of collapsed sections of the structure, and prevention of further collapse: the west facade of the upper level, for example, has been buttressed by scaffolding since 2002, while a Japanese team completed restoration of the north library of the outer enclosure in 2005. Angkor Wat has become a major tourist destination: attendance figures for the temple are not published, but in 2004 the country received just over a million international arrivals, of whom according to the Ministry of Tourism 57 percent planned to visit the temple. The Cambodian flag includes a depiction of Angkor Wat. The influx of tourists has so far caused relatively little damage, other than some graffiti; ropes and wooden steps have been introduced to protect the bas-reliefs and floors, respectively. Tourism has also provided some additional funds for maintenance—approximately 28% of ticket revenues across the whole Angkor site is spent on the temples—although most work is carried out by foreign government-sponsored teams rather than by the Cambodian authorities. The temple has become a symbol of Cambodia, and is a source of great pride for the country's people. A depiction of Angkor Wat has been a part of every Cambodian national flag since the introduction of the first version circa 1863—the only building to appear on any national flag. ↑ Mannikka, Angkor Wat, 1113-1150 Retrieved August 20, 2007. ↑ Higham, The Civilization of Angkor pp. 1-2. ↑ Quoted in Brief Presentation by Venerable Vodano Sophan Seng Retrieved August 20, 2007. ↑ APSARA authority, The Modern Period: The war Retrieved August 20, 2007. ↑ Freeman and Jacques, Ancient Angkor p. 31. ↑ Freeman and Jacques p. 48. ↑ Higham, The Civilization of Angkor p. 118. ↑ Transcript of Atlantis Reborn, broadcast BBC2 November 4, 1999. ↑ Freeman and Jacques p. 49. ↑ Freeman and Jacques p. 50. ↑ Hing Thoraxy, Achievement of "APSARA"
↑ German Apsara Conservation Project, Conservation, Risk Map, p. 2. 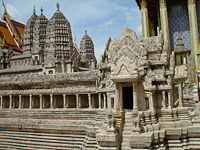 ↑ Tales of Asia, Cambodia Update July 2004: Tourism Boom? APSARA. Angkor Vat Retrieved 21 June 2005. BBC Horizon (4 November 1999). Atlantis Reborn (script). Broadcast BBC2 November 4, 1999, retrieved 25 July, 2005. Buckley, Michael (1998). Vietnam, Cambodia and Laos Handbook. Avalon Travel Publications. Online excerpt The Churning of the Ocean of Milk retrieved 25 July, 2005. CIA. World Factbook: Flag of Cambodia Retrieved 25 July, 2005. Flags of the World. Cambodian Flag History April 9, 2005, retrieved 21 July, 2005. Glaize, Maurice (2003 edition of an English translation of the 1993 French fourth edition). The Monuments of the Angkor Group. Retrieved 14 July, 2005. Hing Thoraxy. Achievement of "APSARA": Problems and Resolutions in the Management of the Angkor Area Retrieved 26 July, 2005. Mannikka, Eleanor. Angkor Wat, 1113-1150 Retrieved 21 June 2005. Nation, The (31 January, 2003). Editor Didn't Check Rumour Retrieved 25 July, 2005. Sharpless, Gordon. Tales of Asia Retrieved 25 July, 2005. University of Applied Sciences Cologne. German Apsara Conservation Project Retrieved 21 June 2005. Vodano Sophan Seng. Brief Presentation May 28, 2005, retrieved 25 July, 2005. Angkor UNESCO World Heritage List. This page was last modified on 21 March 2016, at 15:16.